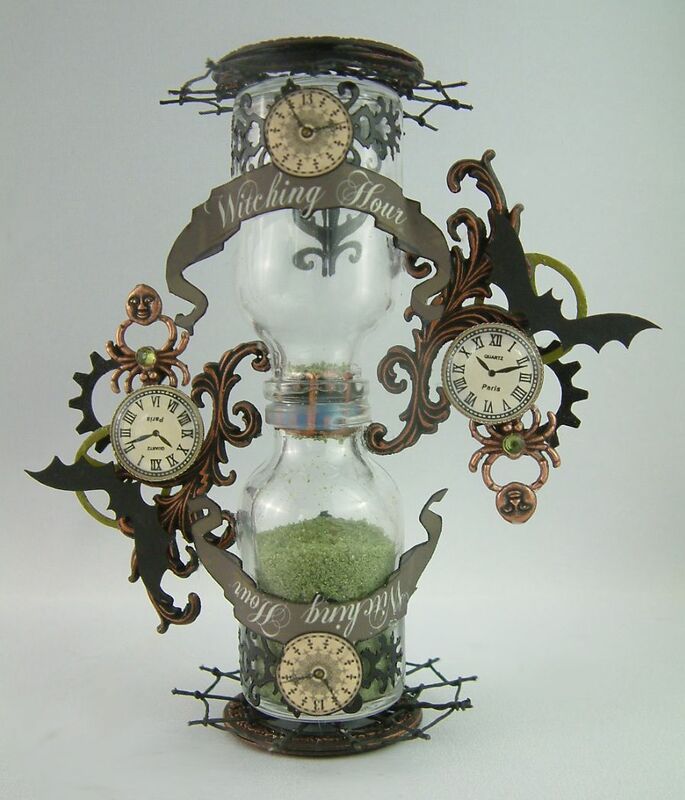 I had such great feedback on my “Witching Hour” hourglass (pictured below) a few months ago that I thought I would create a couple more hourglasses for you and include a tutorial. Creating an hourglass out of two bottles is a unique project and so simple. There are many possibilities for a project like this. Just about any holiday or theme can apply. 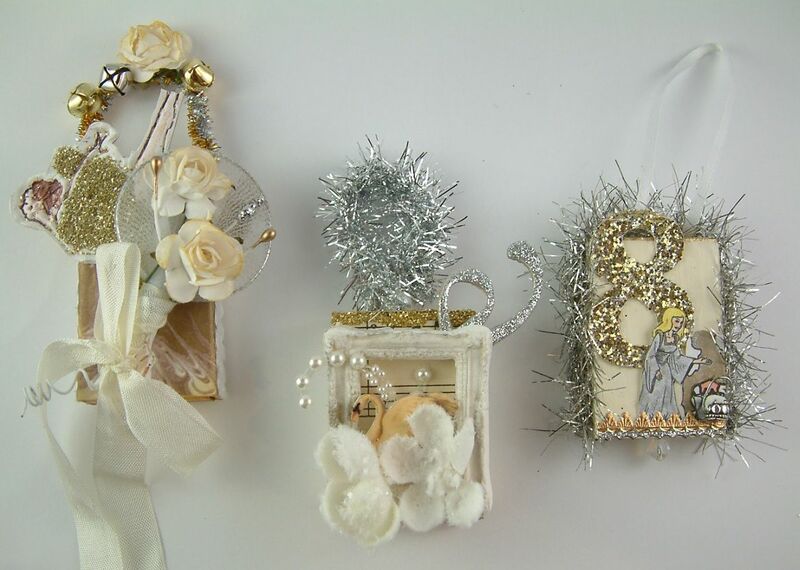 Another option is to create one to celebrate a special occasion like a birth, anniversary or wedding. Or maybe just as a piece of art. 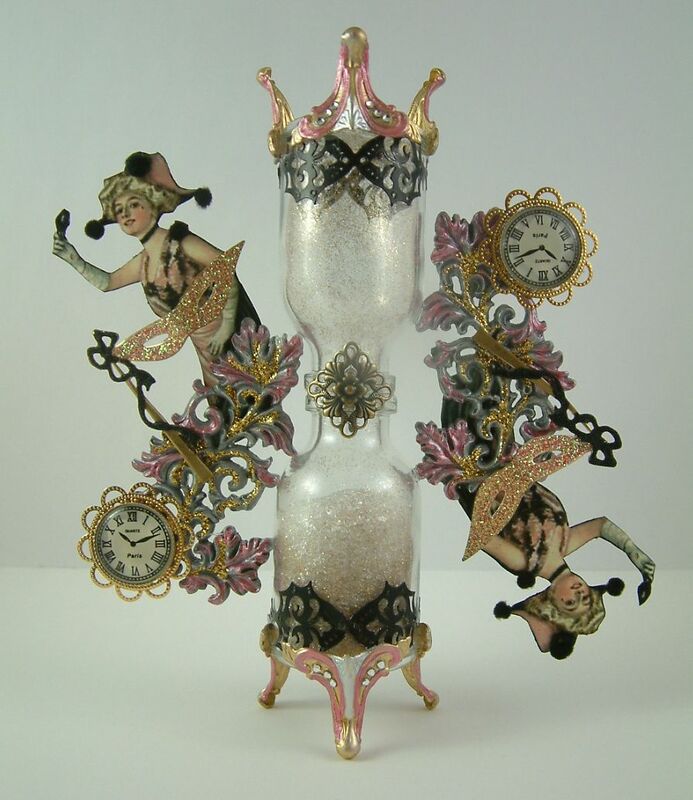 For this tutorial I have created two New Year’s hourglass examples using two different sizes of bottles. 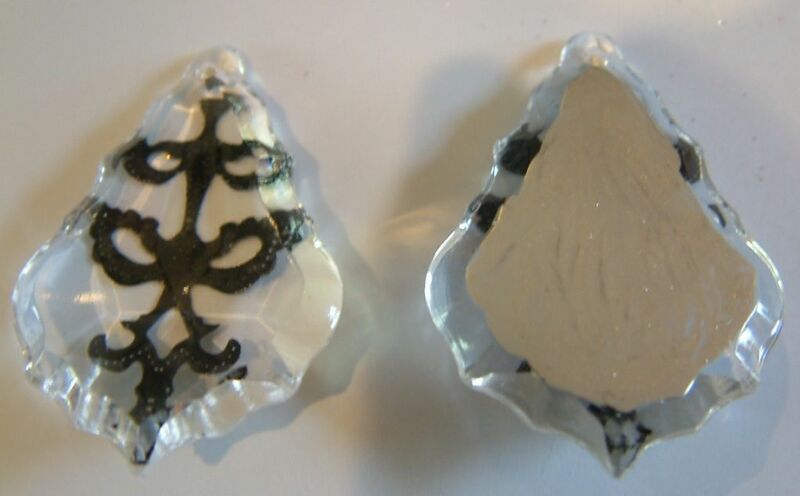 The first hourglass's (pictured below) finished size is 6” tall by 4 ½” wide. I chose these slope shoulder bottles for the project as when combined they have an hourglass shape. The bottles come in two sizes. 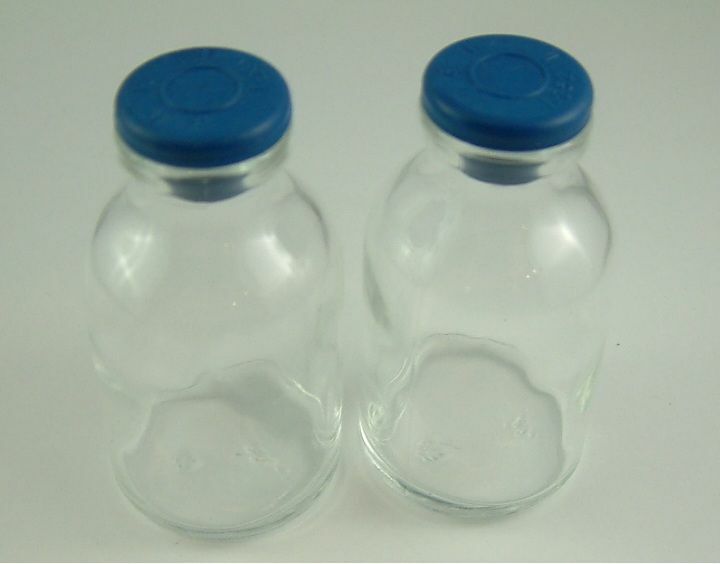 The bottles I used for the first hourglass are 2 5/16” tall x 1 ¼” diameter and are the smaller of the two sizes. I like adding some decor to the bottles to jazz them up. The trick is not to add too much or you won’t see the sand or other mixture falling through the bottles. Stickers work really well for a project like this. 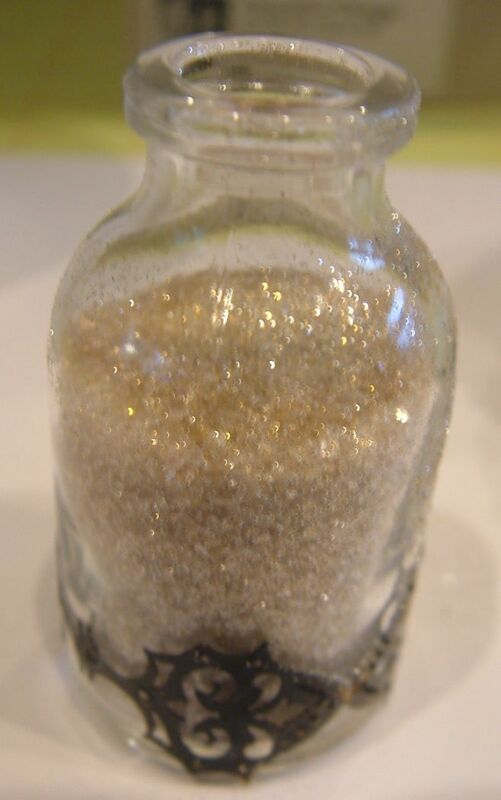 Instead of using sand I created a mixture of Diamond Dust and gold glitter. 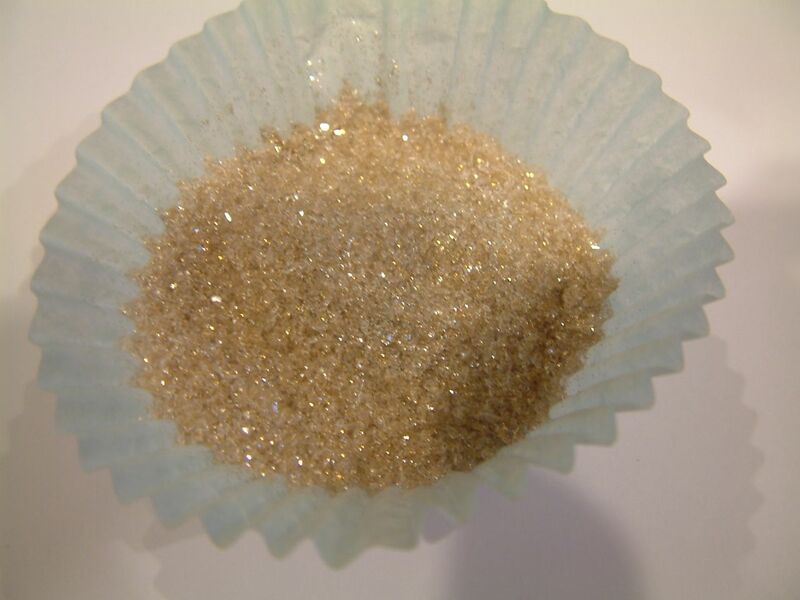 You can use whatever you like (sand, glitter, microbeads, etc.) 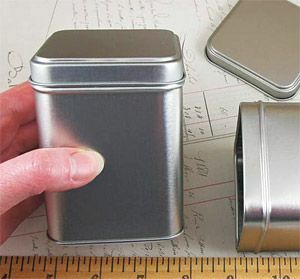 just as long as the individual grains or beads are small enough to pass easily between the openings of the two bottles. I added the mixture to one of the bottles. Some of the glitter sticks to the sides of the bottle giving the glass extra sparkle. 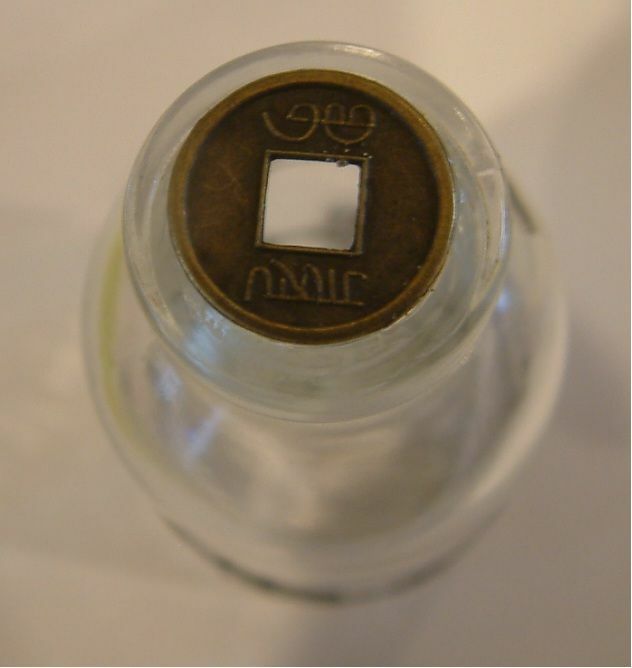 To slow down the flow of the mixture between bottles, I glued a small Chinese coin to the top of the empty bottle. It is the exact size to fit on the inside rim of the bottle. You can use any flat object with a hole just as long as hole it is bigger than the inside rim (so it doesn't fall into the bottle). It can also be larger than the outside rim of the bottle. I used E6000 glue to attach the coin. Allow it to completely dry. Then use the glue to attach one bottle to the other. Next, I glued the two bottles together using E6000 glue and allow it to dry. 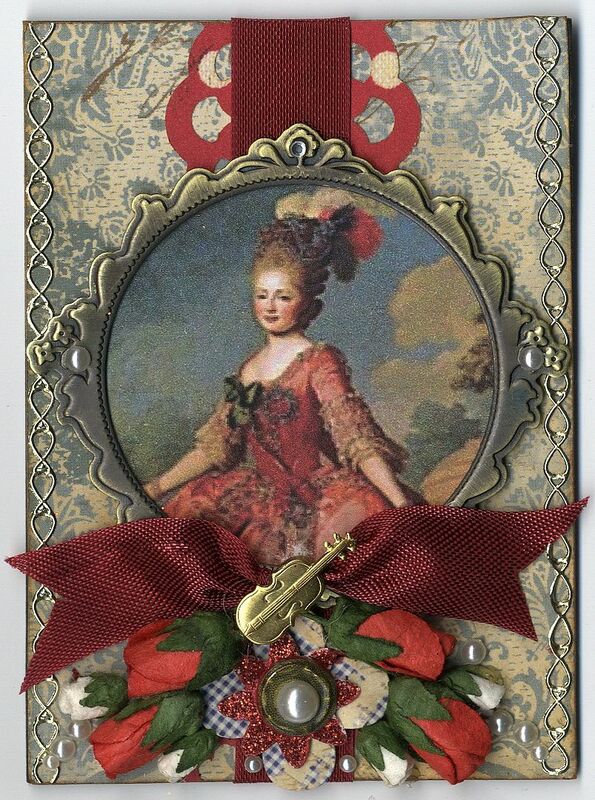 You all know by now that I like to add lots of embellishments to my project. 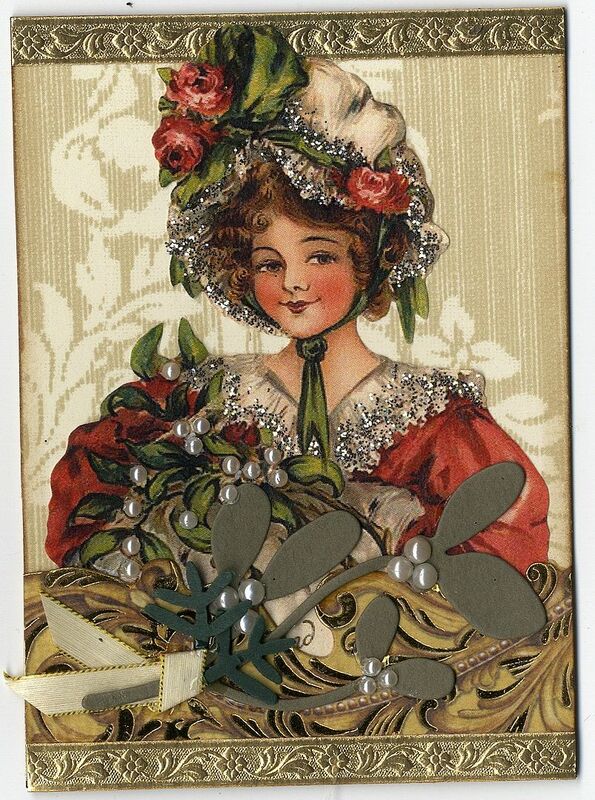 With an hourglass, the surface for embellishment is very limited. I solved the problem by adding elements that give me more surface area. These leaf flourishes worked perfectly. They were originally silver. I used Flamingo Liquid Pearls and Goldenrod Stickles to add coordinating color and sparkle. I glued the flourishes to each side of the bottles using E6000 glue. 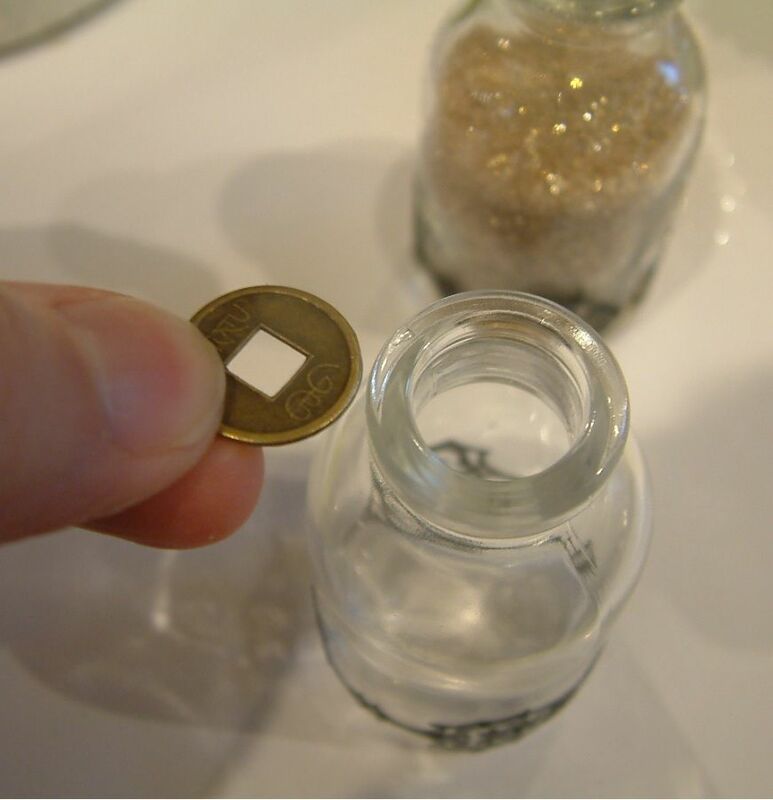 Since the contact areas between the flourishes and the bottle are really small, you need to use strong glue, giving it adequate time to dry before proceeding. 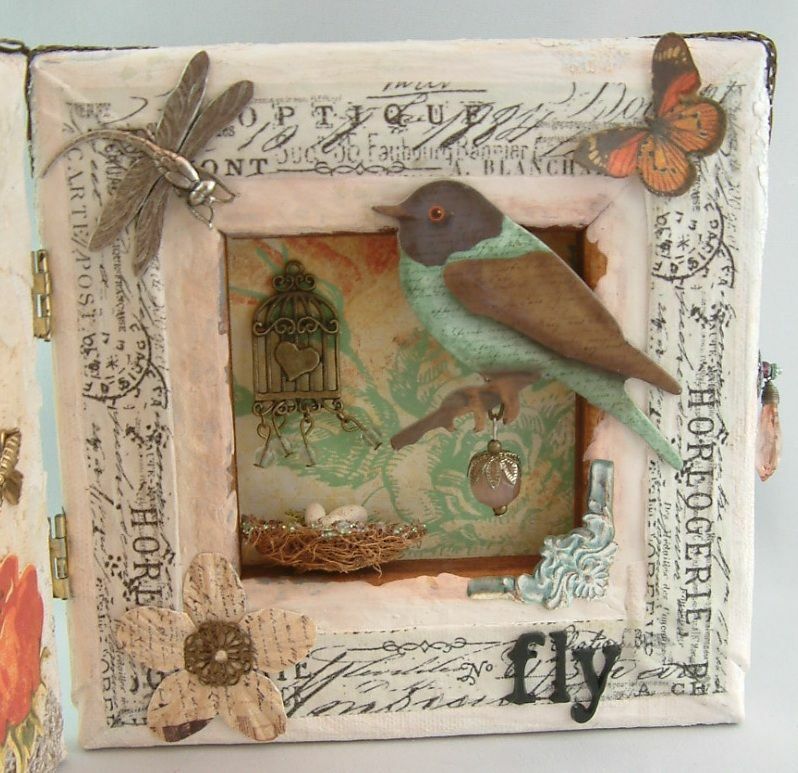 You can see in the picture that I supported the flourish using a stack of chipboard. I also added some weight on top of the flourish to keep it straight. I placed a bottle on the other side of the hourglass to keep it from rolling. I let it dry 24hrs before attaching the flourish to the other side. My climate is very dry so you may need more time if you live in a wet climate. 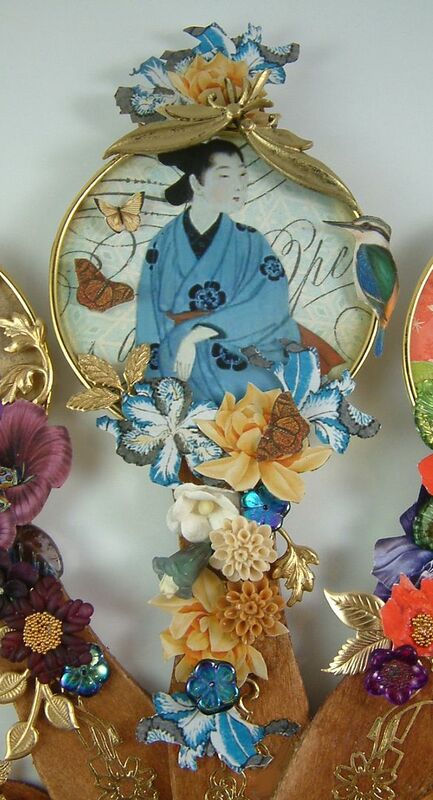 Once the flourishes were firmly in place I started adding other embellishments. The mask is brass and I jazzed it up with black and pink glitter. The clock is a button that is glued to a piece of gold filigree. 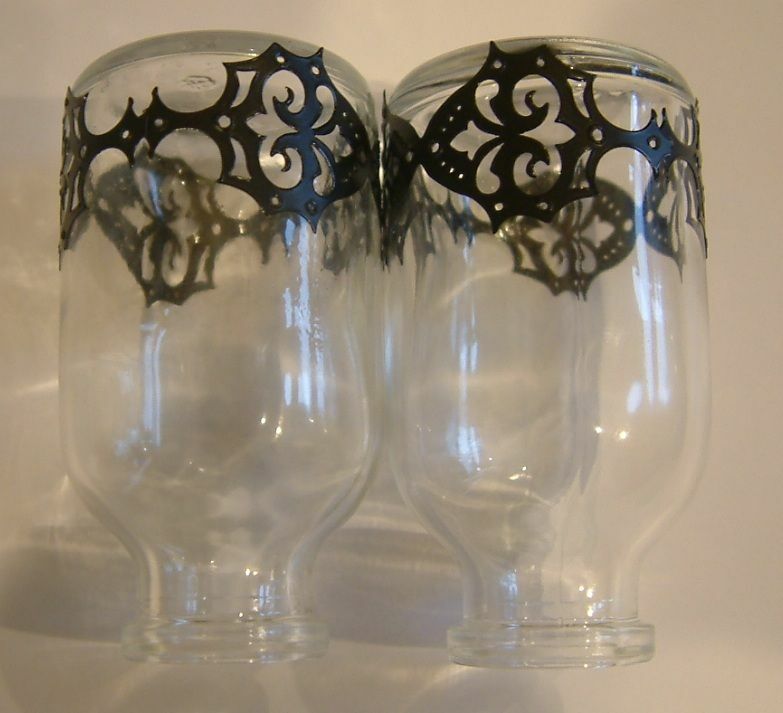 I added a piece of filigree to the seam between the bottles. The last step was to add the feet. You want to add them last as you don’t want extra pressure on the feet while you are adding other elements. The feet are made to attach to a corner. I used needle nose pliers to bend the feet to fit around the curve of the bottle. 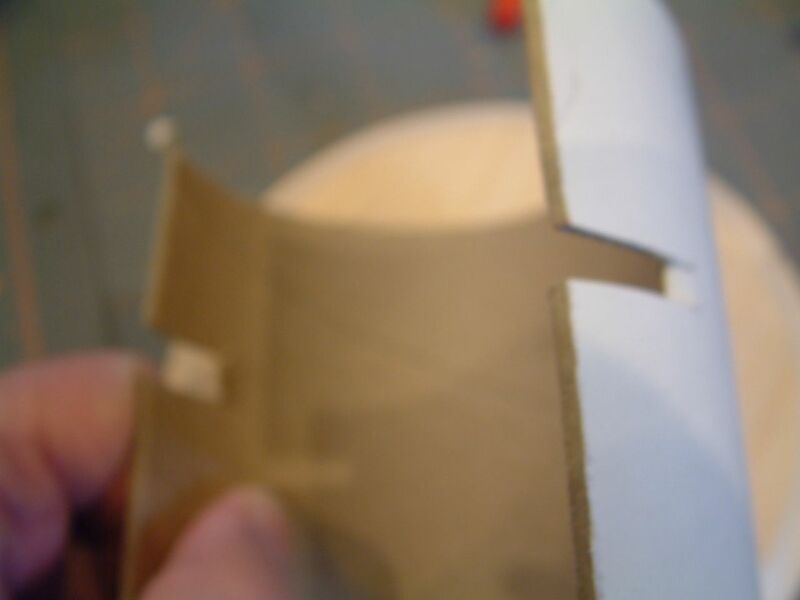 The feet don’t have to fit perfectly flush; just enough to create contact points for the glue. Again I used E6000 glue and allowed the feet plenty of time to dry. Make sure that all your feet are on the same level so that your hourglass stands up straight. Because of the size of the bottle and the size of the feet, I used three feet on each side, spaced equal distance apart. I painted the feet with Flamingo Liquid Pearls and Silver Alcohol Mixative. As a final touch I added clear rhinestones. This second hourglass is much larger than the first. 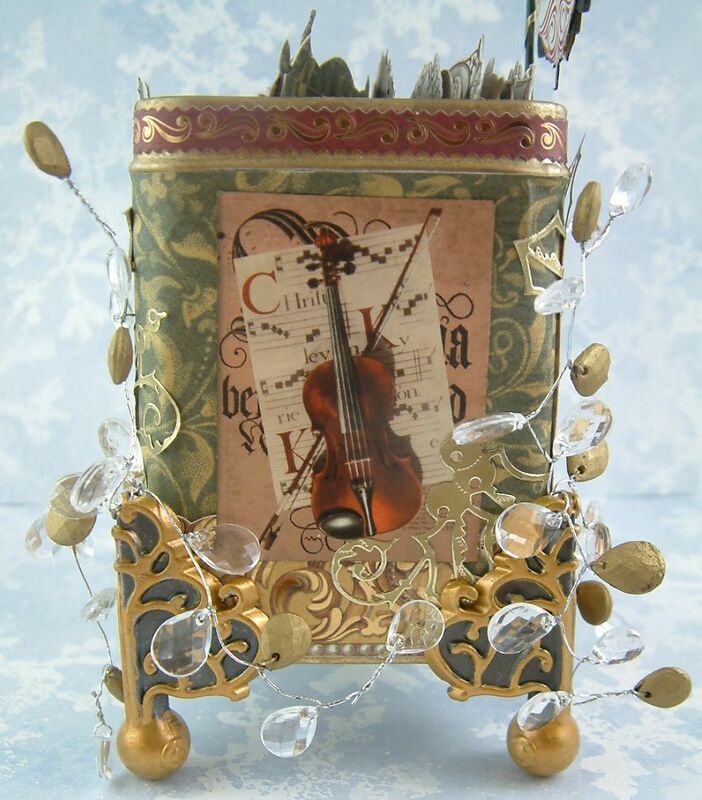 For this one I used the larger 3” 11/16” tall by 2” diameter slope-shoulder glass bottles. The finished height of the hourglass is 10”. The construction of the hourglass is exactly the same as the first bottle. 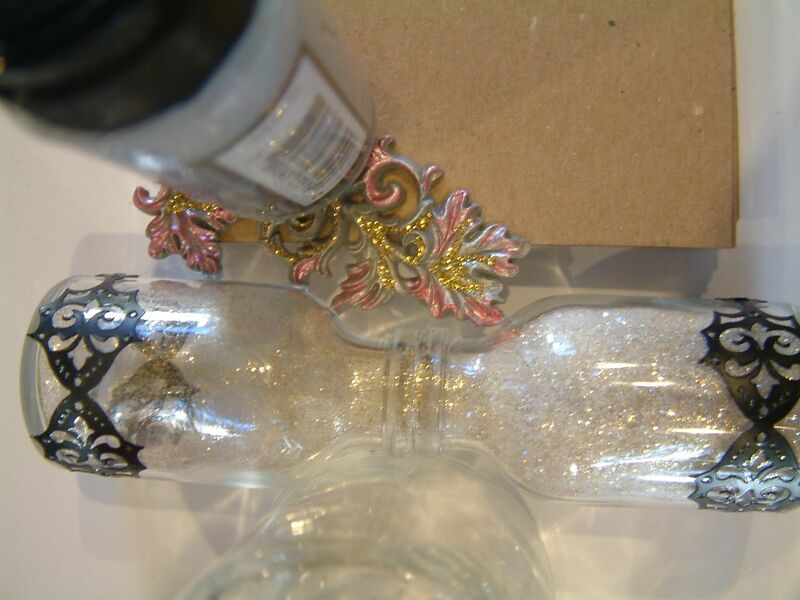 For this bottle I used a mixture of silver and black microbeads inside the bottles. Since the opening of these bottles is larger than the first bottles, I used a small washer to limit the flow of the microbead mixture between the bottles. 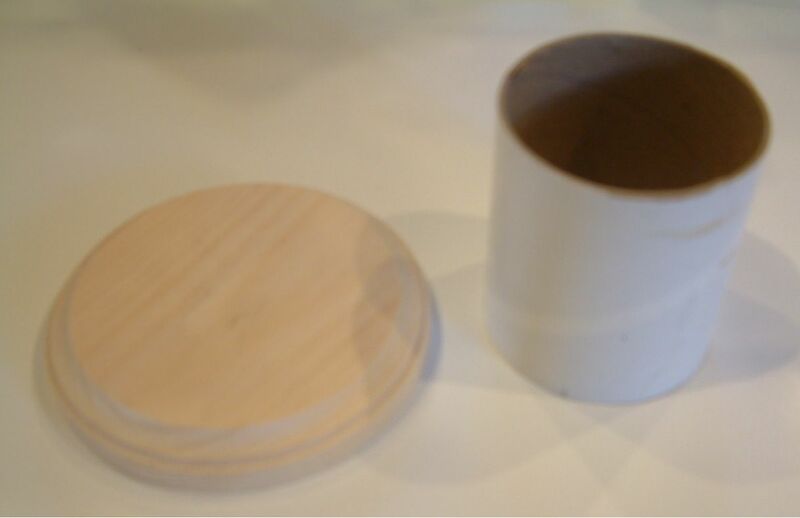 Instead of feet I used two wood egg cups as stands. I wrapped the star tinsel and falling star wired sprays around the necks of the bottles. The wired sprays gave me a place to attach the images. 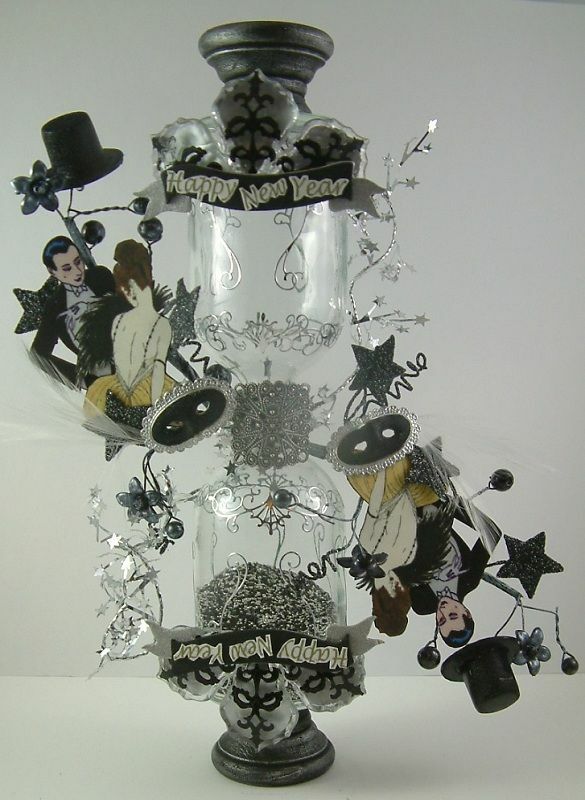 I used Glossy Accents to coat the top hats with black glitter. The masks are brass that I first painted silver with Silver Alcohol Mixative Ink and then added black glitter and white feathers. 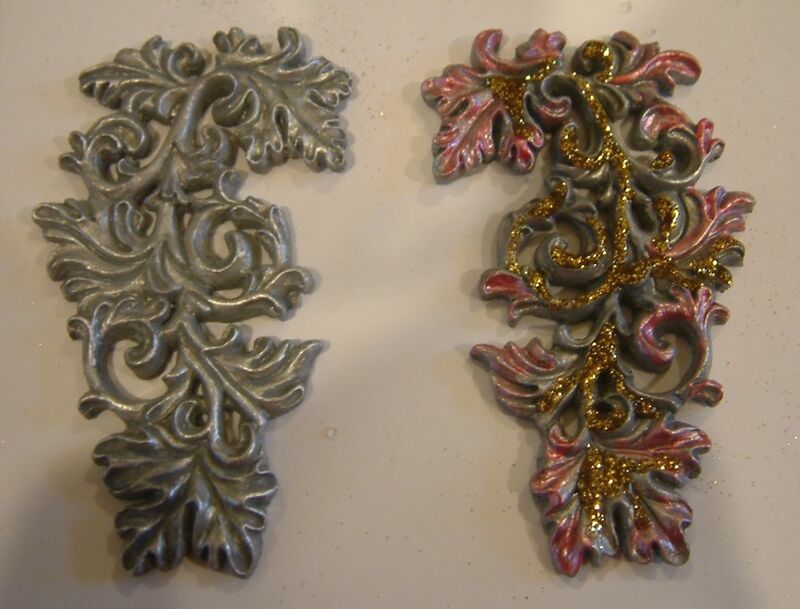 I painted the backs of acrylic chandelier crystals with Silver Alcohol Mixative Ink and added stickers to the front. I glued them together in sets of three using E6000 glue before attaching them to the bottles. The Creative Team girls have been quiet as of late, but they did manage to squeeze in a few craft projects this summer and one of them was to make hinged canvas books. The first one I’d like to share is made by Fran Skoog. Fran’s book is just beautiful. 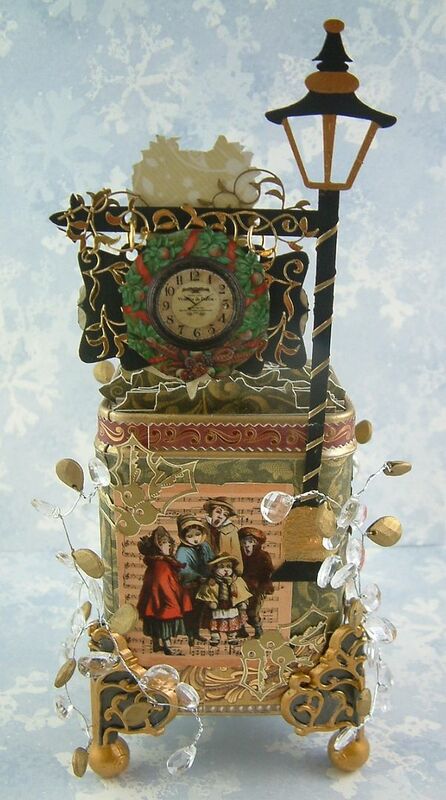 The chipboard clock she used on the front is from an Arizona company that the girls discovered called Leaky Shed Studio (click here to jump to their website). 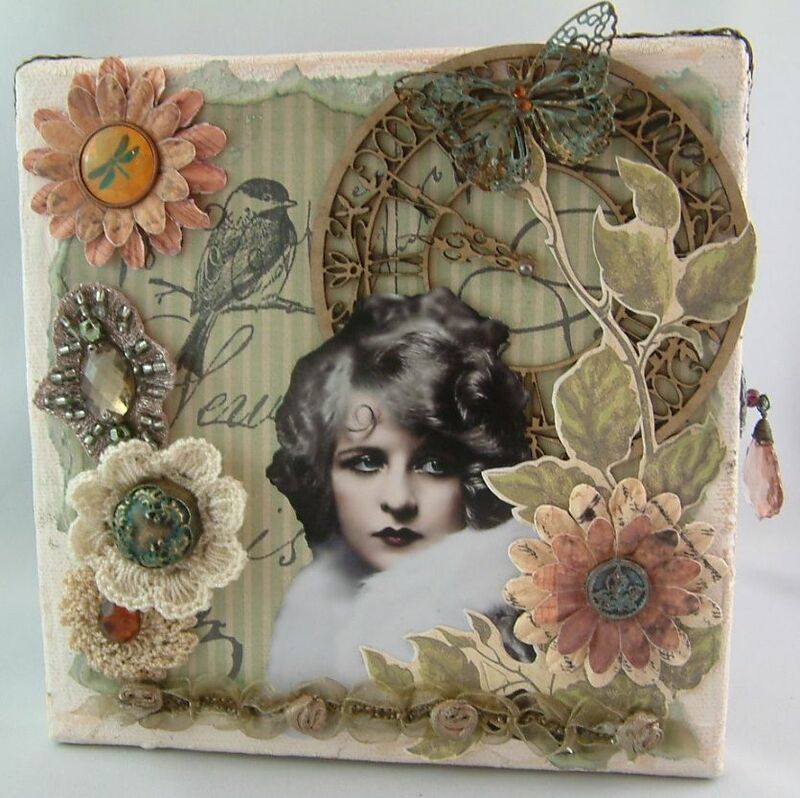 Click here for the tutorial on how to make a hinged canvas book. 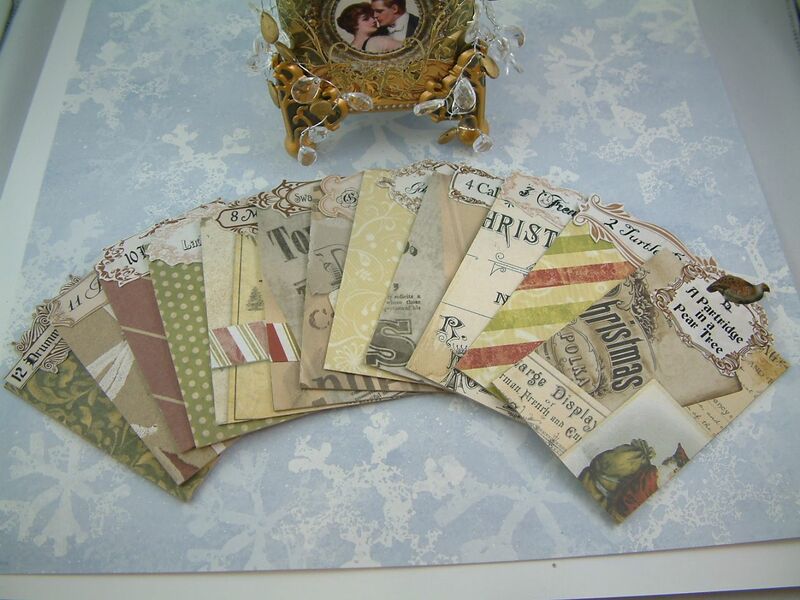 Below are lovely Christmas and New Year themed ATCs by various artists. 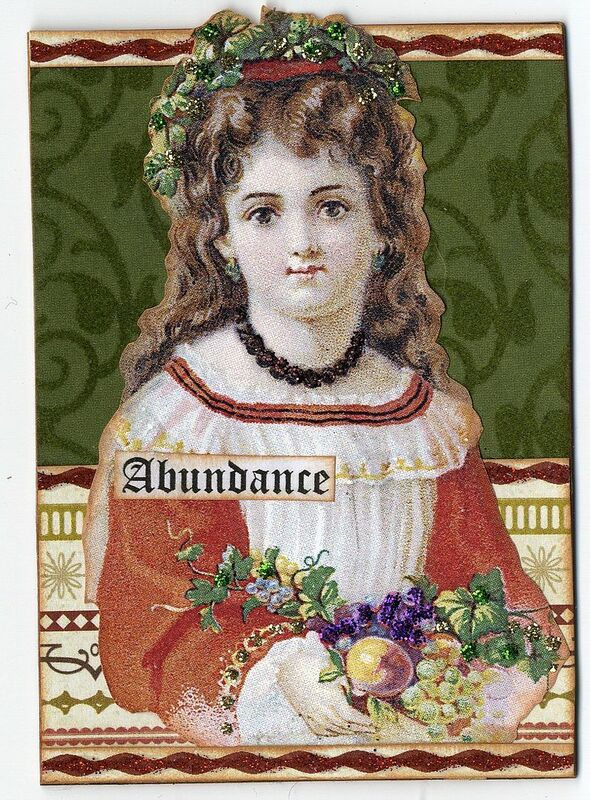 These are cards I’ve received from various exchanges in the trading groups I belong to. I’ll be posting a new tutorial before the end of the year so stay tuned! 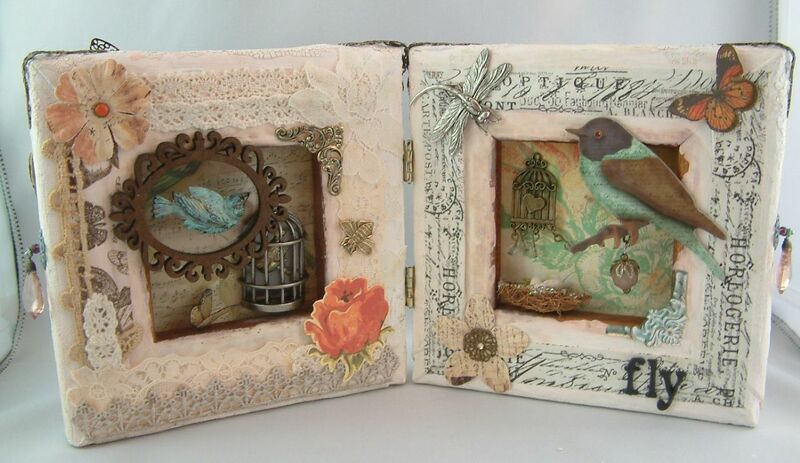 If you are into ATCs like I am, you are always looking for ways to display your ATCs. 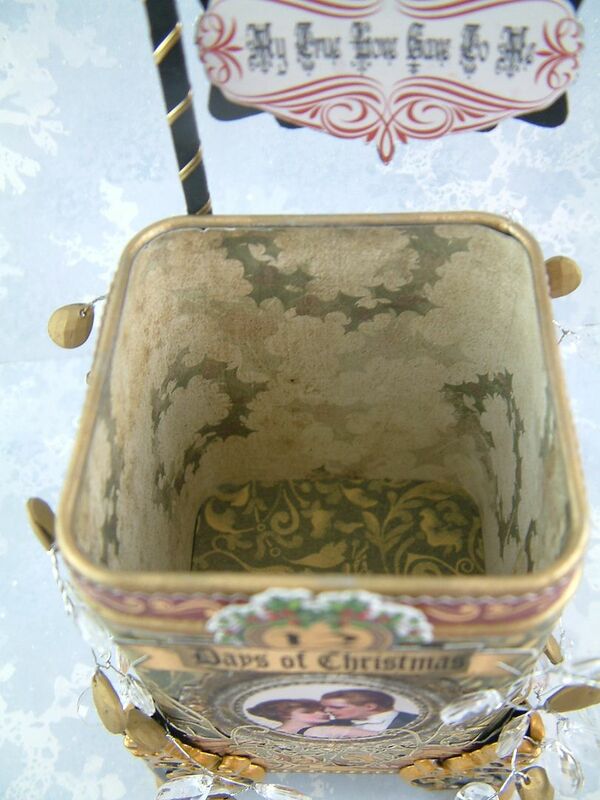 Why not create a festive altered tin to show off your ATCs and add to your holiday display. 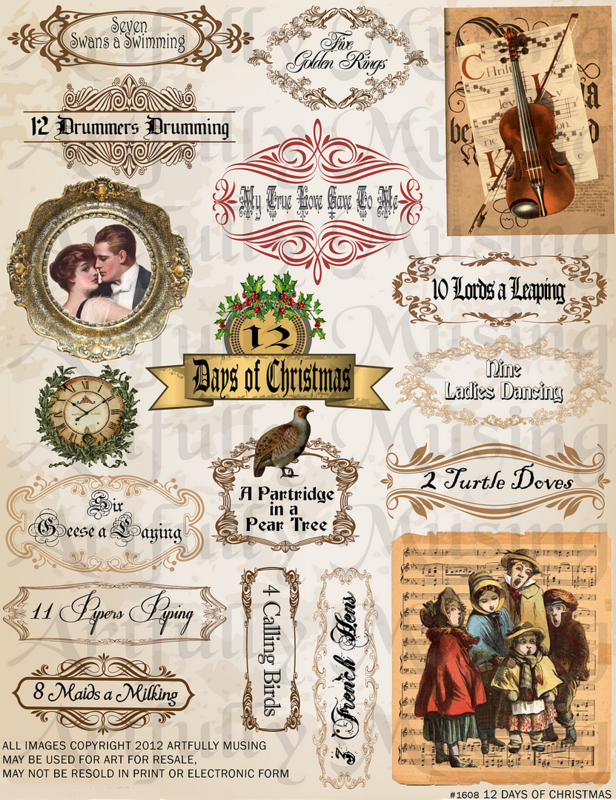 This sheet contains labels for each of the 12 Days of Christmas and some coordinating images. 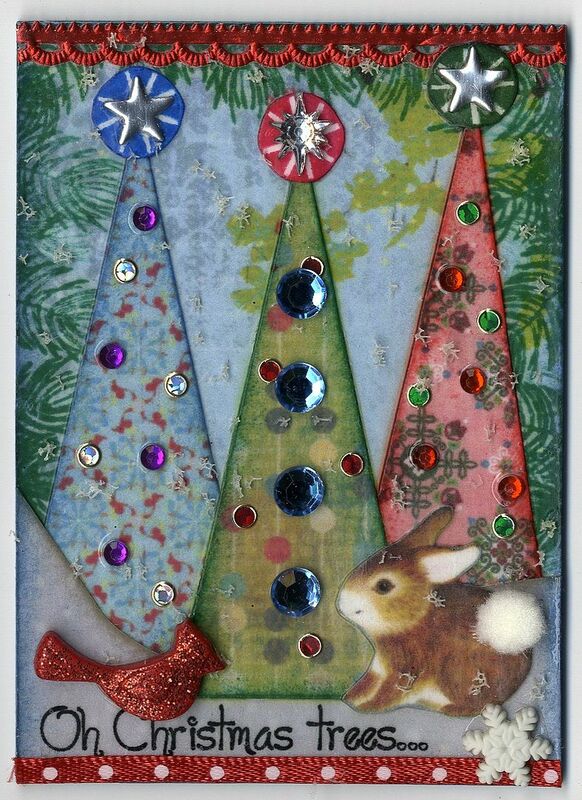 I mocked up some ATCs using the 12 Days of Christmas labels from my collage sheet so you can see how they would look in the tin. 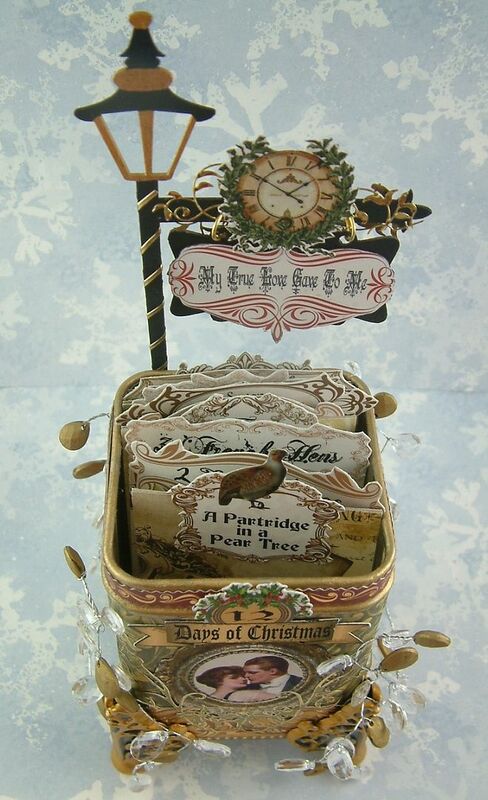 Recently I posted the matchbox ornament I made for a swap hosted by Tabitha Campbell. The theme was the “12 Days of Christmas”. Each participant signed up for a day and made ornaments for all of the other participants. Each matchbox was filled with all kinds of crafting goodies. 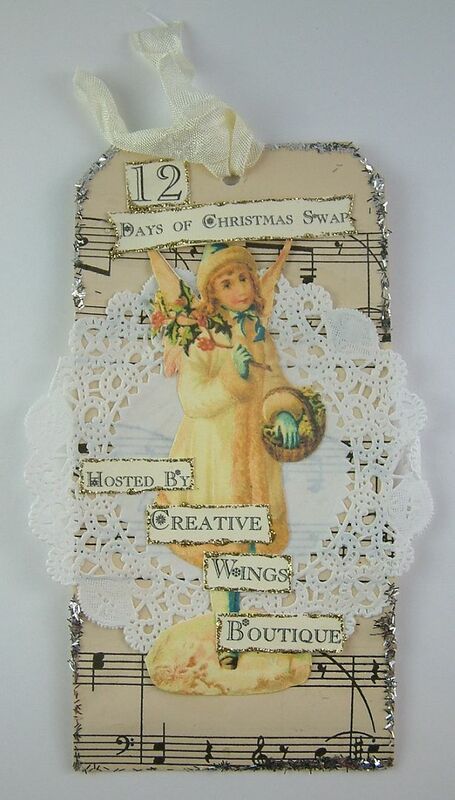 Tabitha made a tag for the swap (picture above) and on the back of the tag is the list of all the participants. The matchboxes are the tiny ones that come 10 to a pack. 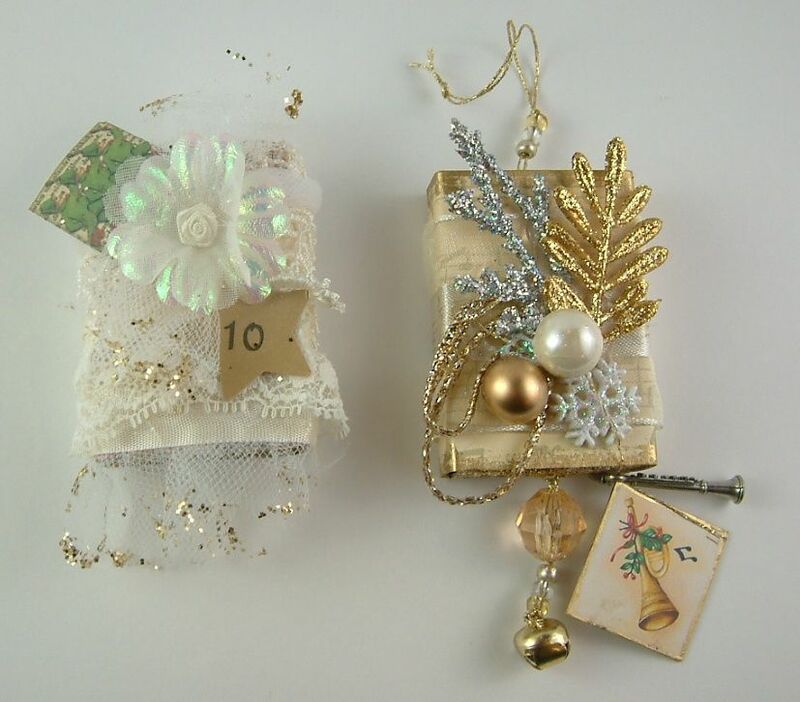 Below are all of beautiful ornaments I received. 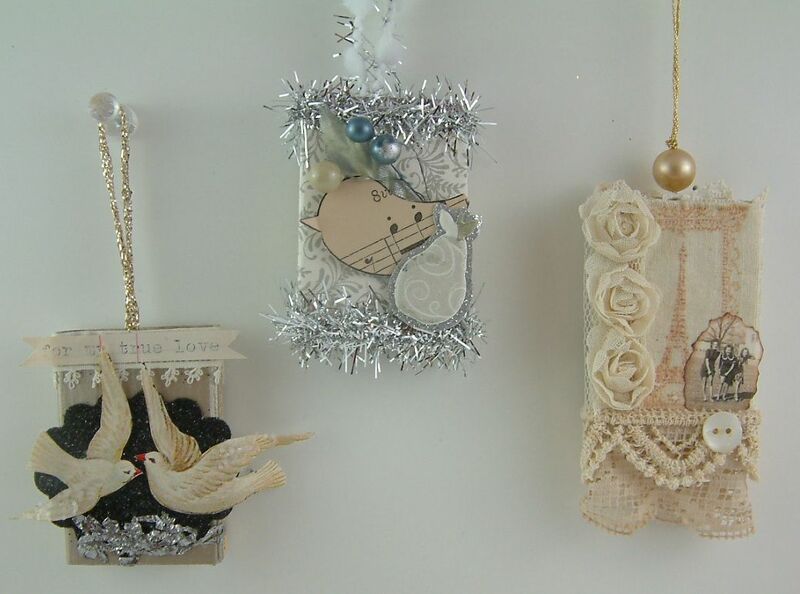 From left to right “2 Turtle Doves” by Lynn, “A Partridge in a Pear Tree” by Pamela and “3 French Hens” by Terri. 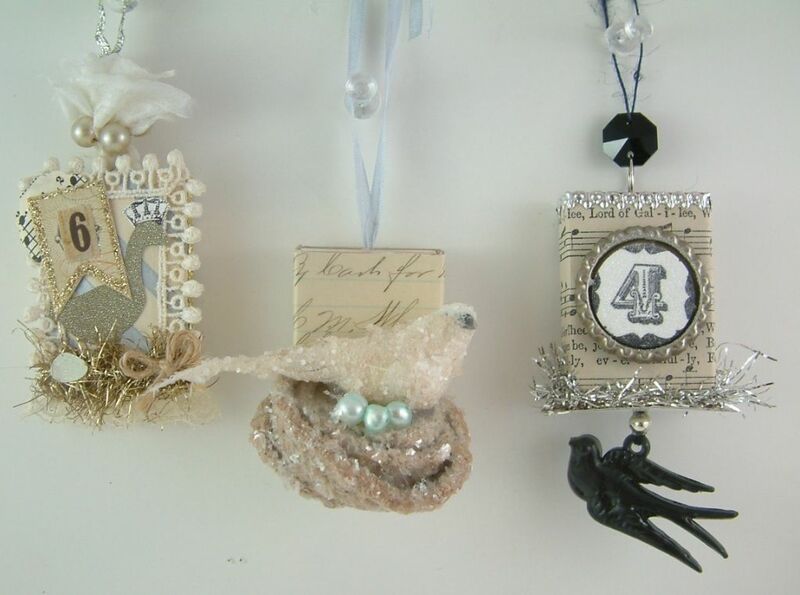 From left to right “6 Geese a Laying” by Holly, “5 Golden Rings” by Hope and “4 Calling Birds” by Kimberly. From left to right “9 Ladies Dancing” Caroline, 7 Swans a Swimming” by Tabitha and “8 Maids a Milking” by Alice. From left to right; “10 Lords a Leaping” by Mercedes and “11 Pipers Piping” by Beverly. Thanks to all for your beautiful artwork!! A few days ago I posted about an altered bottle swap that I participated in and I posted pictures the bottle I received. Here is the bottle I made for my swap partner Melanie. I started by frosting the bottle. I then added metallic stickers and layers of lace and metallic trim. On top of the trim are beaded snowflakes. The stopper at the top is a crystal drawer knob. 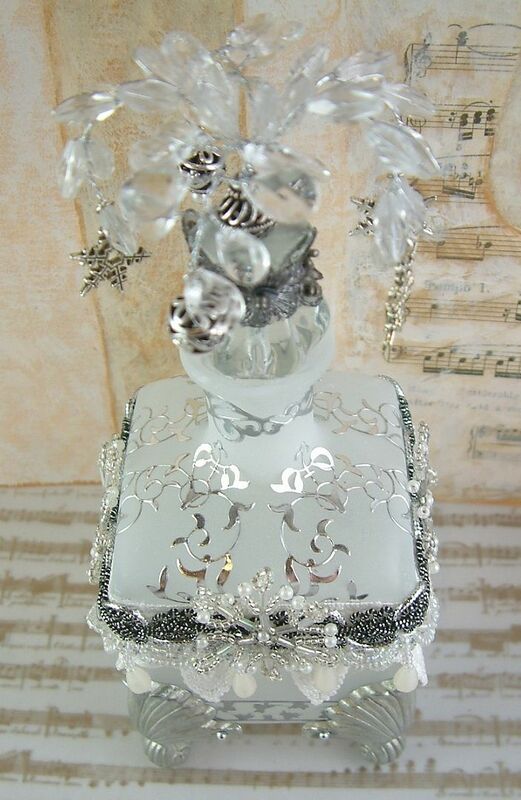 I added a silver bead to the top which holds the beaded sprays and snowflake and ornament charms. Each side of the bottle is the same. Yes, there is an altered bottle tutorial coming that includes the frosting technique that I used and more!! From December 1st through the 12th, each of the Alpha Stamps Design Team members and some guest designers are creating a “12 Days of Christmas” themed piece of art. 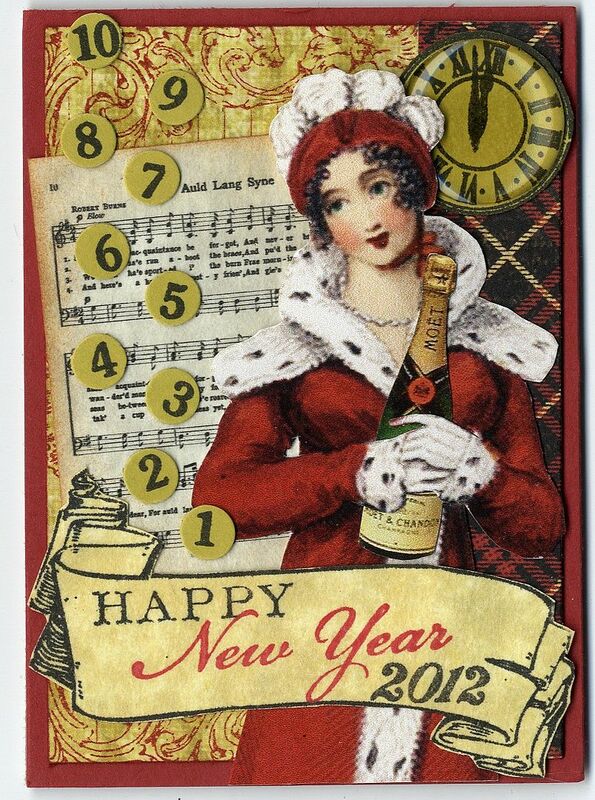 My day is “5” which according to the traditional song is “5 Golden Rings”. 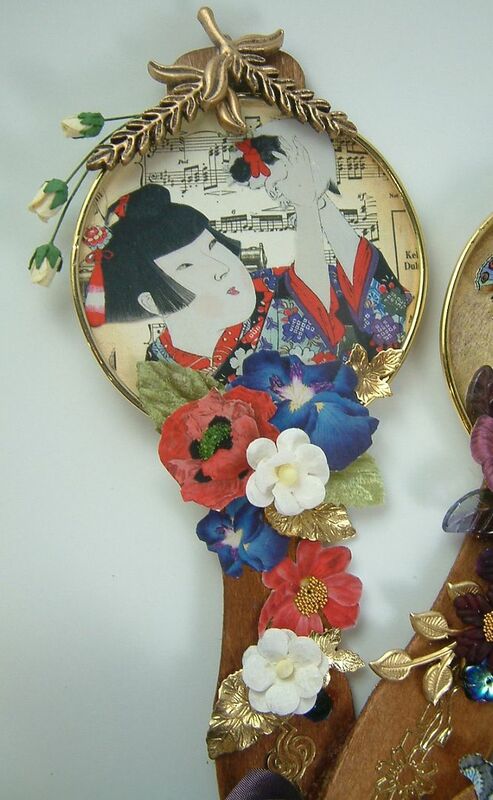 I’ve chosen to go off theme with the Geishas but still incorporate the 5 golden rings in this fan. 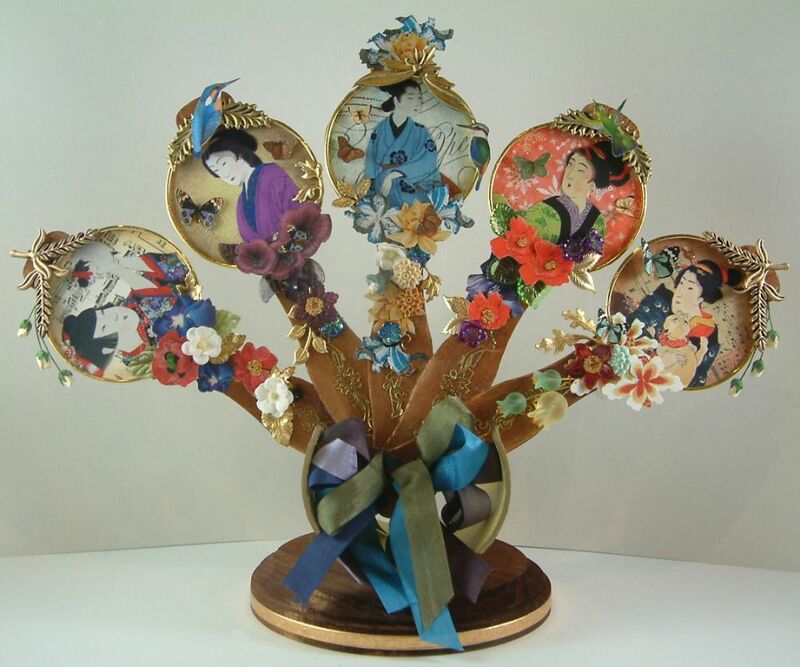 The fan blades are glued in place as there are so many embellishments on the front of the blades that it would tear the fan up to open and close it. 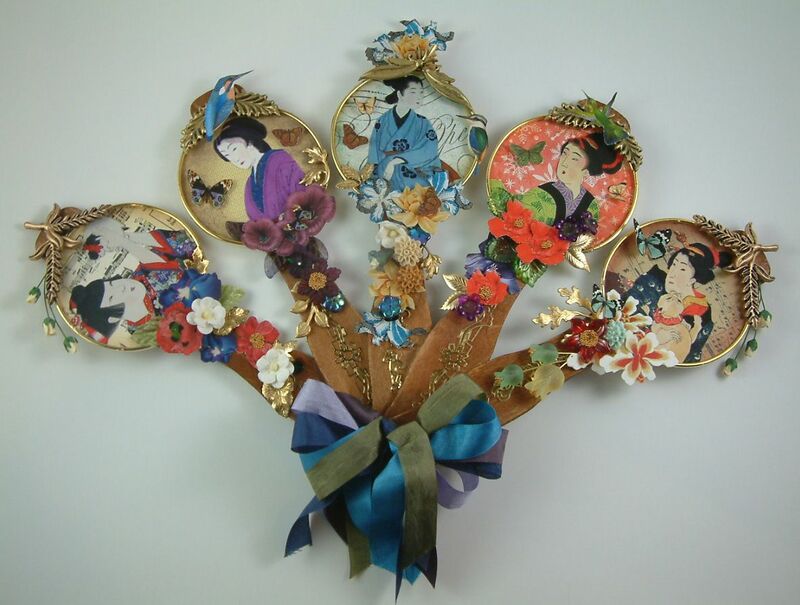 I used images from my new Geishas Collage Sheet to decorate the fan with some additional dimensional flowers and leaf embellishments. I inked the edges of the papers and images with Ranger Distress Inks before attaching them to the back of the bangle. 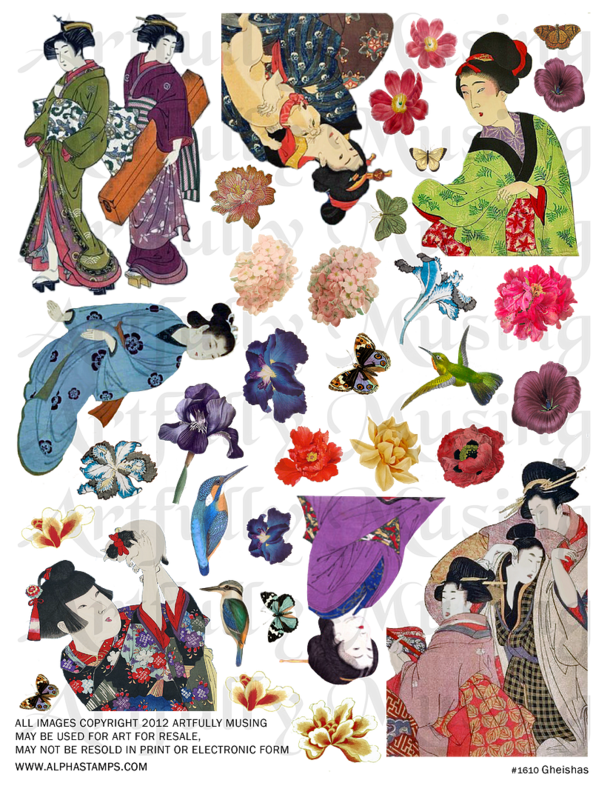 The collage sheet contains several geishas, birds, butterflies and flowers. 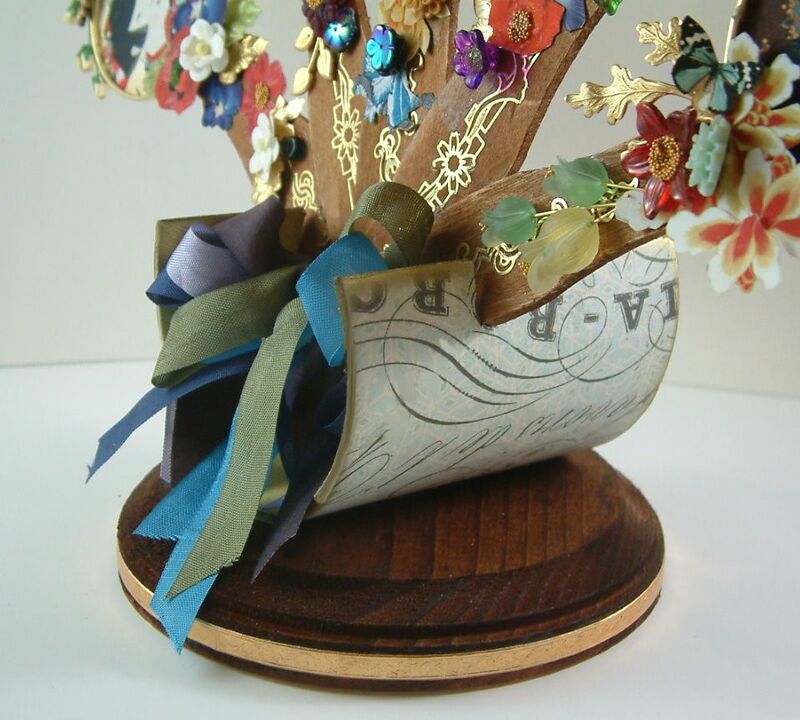 To the paper flowers, birds and butterflies I added several dimensional flowers. Some of the dimensional flowers and leaves are dyed with alcohol inks. 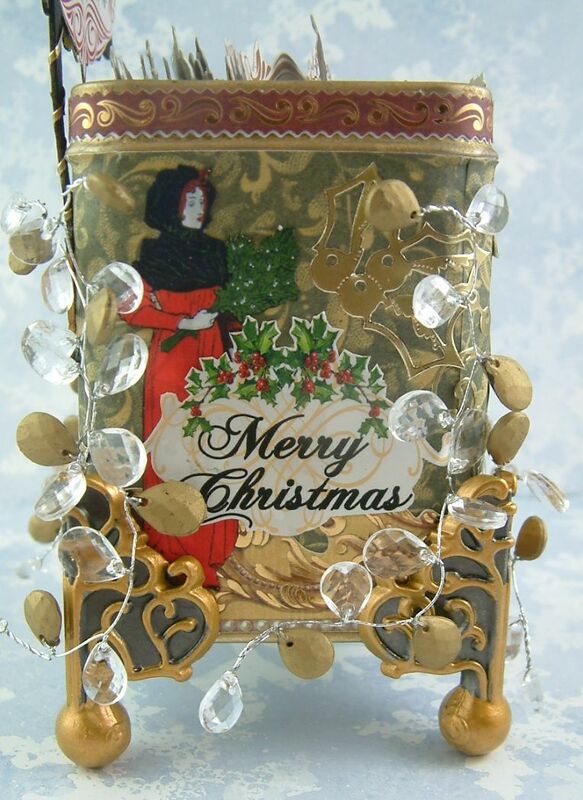 The paper in the background is Christmas themed paper from the City Side Walks 8x8 Paper Pack. The papers in the pack are more subtle and I thought they would be a great backdrop and not compete with the bright and intense colors of the images. 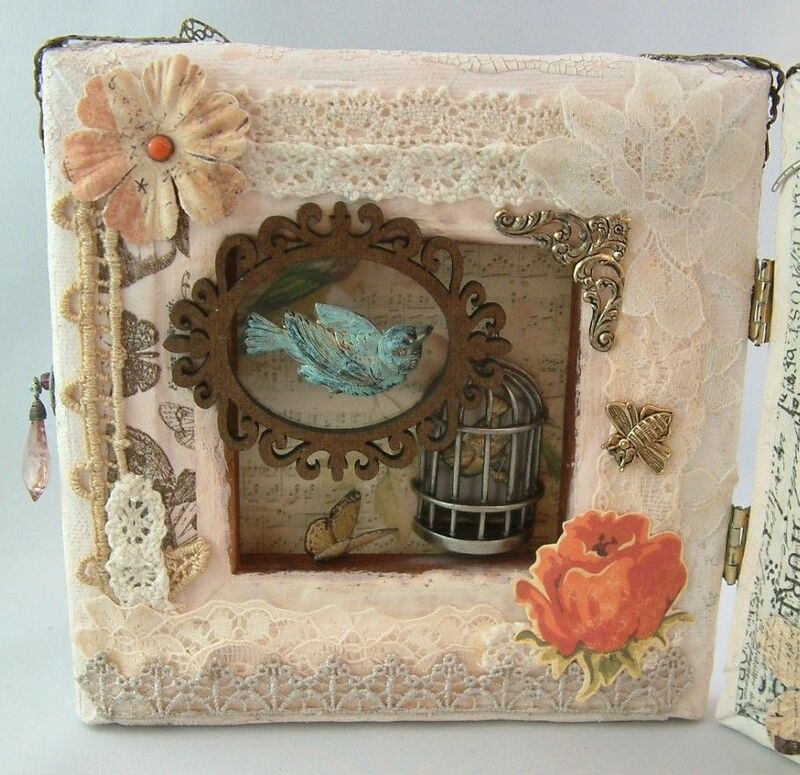 Many times I don’t worry about the theme of the paper I use as by the time I add layers of images and embellishment you really only get a sense of the color of the paper in the design. 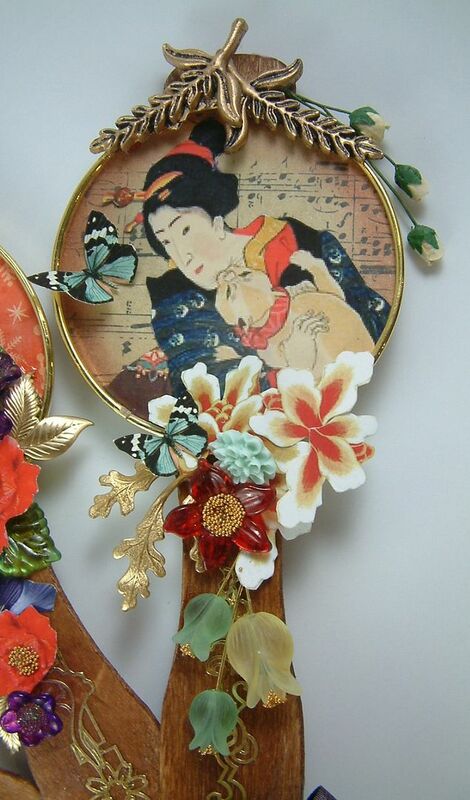 The fan is constructed from wooden fan blades and gold bangles. I stained the blades and the base using Vintage Photo Distressed Stain. 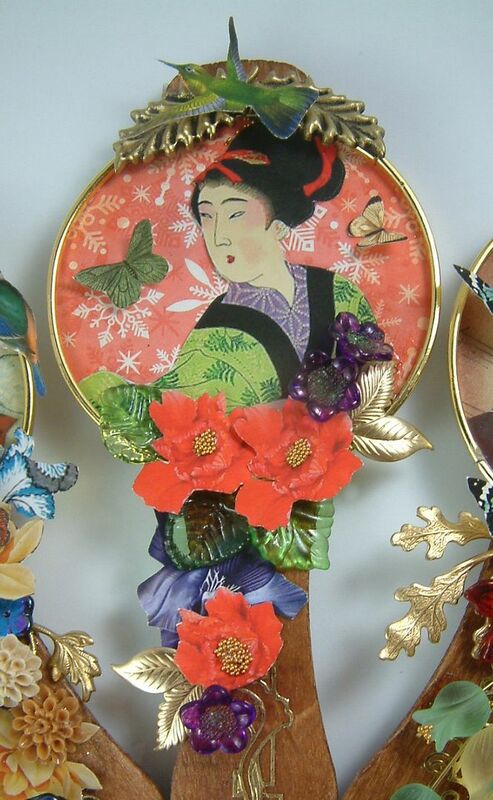 As the bangles are ridged they make a perfect structure for the geisha images and embellishments. They also provide the “5 Golden Rings”. 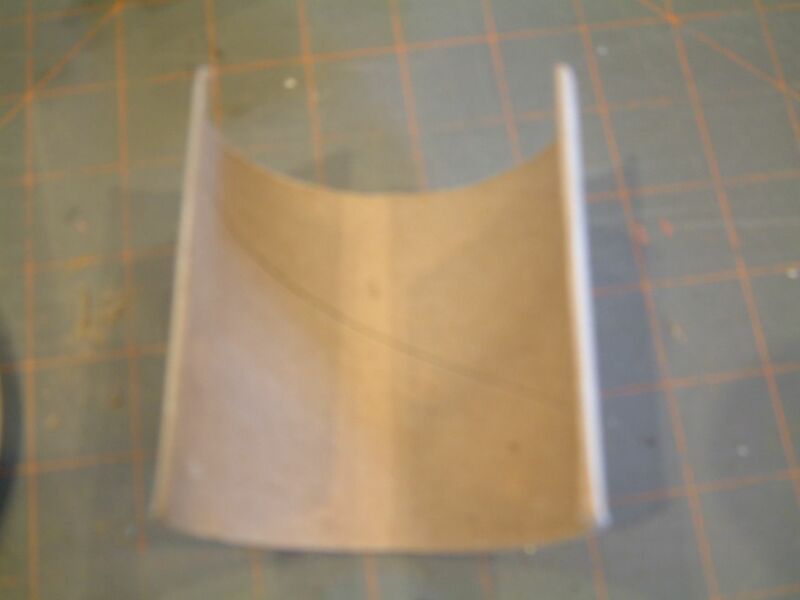 I first cut a piece from the mailing tube that was slightly shorter (on it’s side) than the wood. 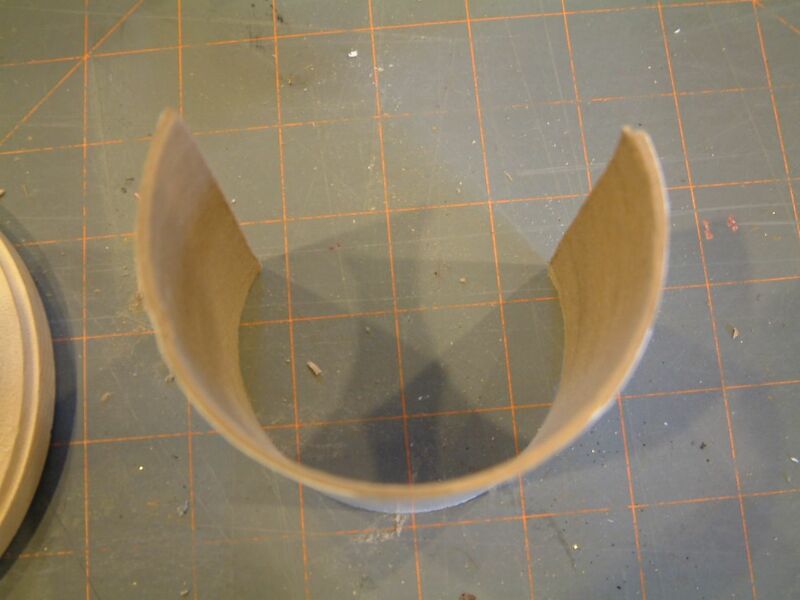 I cut away a section of the tube which serves as an opening for the fan. Next I cut away slots on each side of the tube. NOTE: The size of the opening you cut and the size of the slots depend upon your fan. When you sit the fan in the opening you don’t want it to touch the bottom. The wider you cut the opening the lower the fan sits. Also, don’t cut the slots directly across from each other as the first and last blades of the fan are not even with each other. One slot should be further in front of the other slot. Cut your slots just a little wider than the fan blade. If you cut the slots too wide, the fan will flop around in the stand. After cutting the opening and the slots in the piece of mailing tube I covering it with paper and screwed it into the wood base. 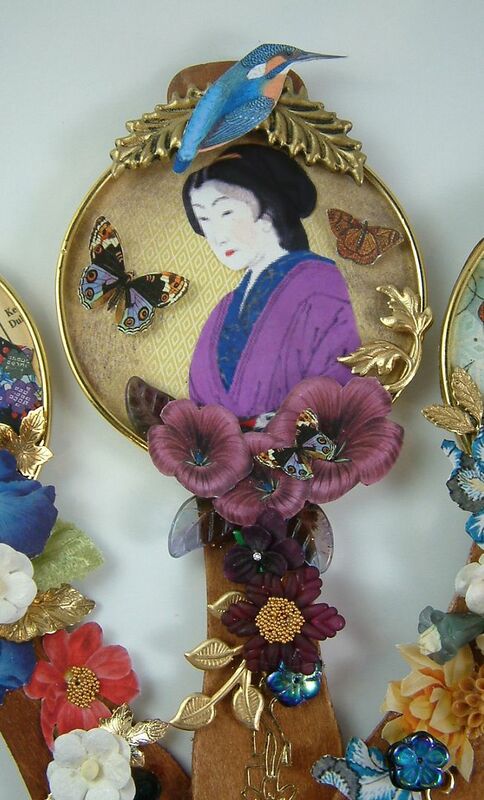 In honor of my new Geishas Collage Sheet I’m giving away two of them (two winners). Just leave a comment on this post or email me (the button is in the right hand column of the blog) by end of the day on December 9th and let me know if you want to be in the drawing. The winners will receive the sheet in either printed for or electronically (per their choice). I’ll be using Random.org to draw for the winner on December 10th.